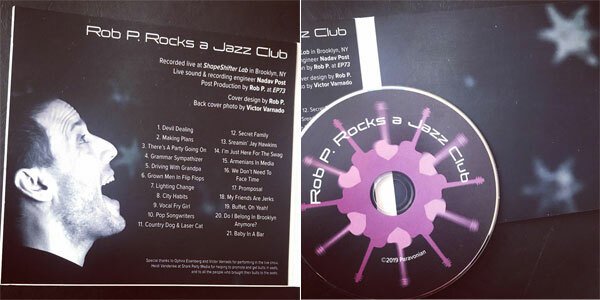 Rob P. Rocks a Jazz Club, my new live concert album, is now available anywhere digital music is sold! 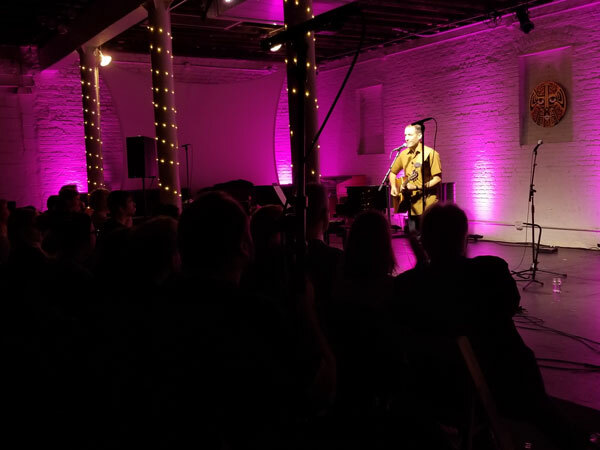 I’m so excited people will finally get a chance to share all the fun we had at the live show back in November at ShapeShifter Lab. The finished product is pretty close to the full live show, the only things we edited out were some stops to tune the guitar, some sips of water, and overly loud breaths—because apparently when the mic is right up on my mouth during large chunks of fast lyrics I gasp for breath like I’m on the last mile of a marathon! We did leave in the jokes about the first lighting change, which I think is funny just because you hear the audience react and have to wonder what’s going on. We also left in the very Brooklyn-specific encore song “Do I Belong In Brooklyn Anymore?” because musically it sounded so great and the audience really responded to it. However you listen/buy the album I hope you enjoy it because I had a lot of fun putting it together and I think it has some really good stuff on it. Thanks for checking it out!